A city of Parisian charm and grace with an Asian edge, Hanoi is an enthralling blend of East and West and a rising star in South East Asia. Vietnam’s capital has much to explore - museums, parks, history and culture abound. Don’t forget to check out the local cuisine and enjoy the nightlife in this busy city. Visit stunning Halong Bay on a junk boat (a traditional Asian vessel) whilst cruising among the bay's 3000 islands rising dramatically from the emerald waters. The cruise will marvel you with thousands of picturesque rocky islets, caves grottos of all shapes and sizes. Halong Bay is a well-known UNESCO “World Heritage” site. 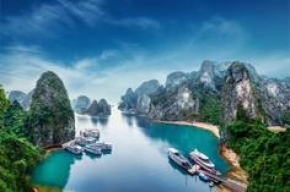 Most of the islets on Halong Bay are limestone formed over 500 million years ago.